MONDAY, MARCH 12, 2018 10:00 A.M. CST. AUCTIONEERS NOTE: Don’t miss this Outstanding Farm Sale. All of the items are well cared for with a good maintenance program. Please be on time because there won’t be any small items. 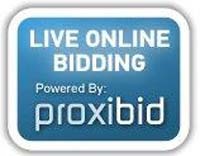 ProxiBid will be available to preregistered online bidders the day of sale. Lunch will be served. For pictures please go to WhiteAuctionService.com web page. Viewing of the items will be on Wednesday, Thursday, Friday before the sale.